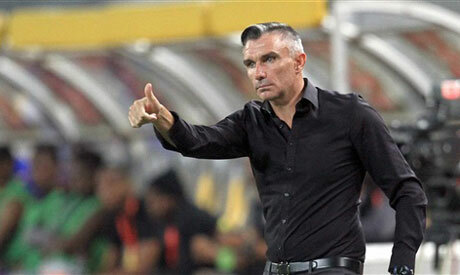 Ahly's coach Patrice Carteron said on Sunday that his side will take the Arab Championship seriously as they look to win the regional competition title. The Red Devils will start their mission in the Arab Championship on Tuesday when they face Lebanese side Nejmah at Alexandria's Borg El-Arab Stadium. "Our target is to win the tournament's title," Carteron told a news conference on Sunday. "Ahly are a great team who are always looking to win. The competition will be very tough with the participation of many strong sides, but we are ready for any challenge." The Frenchman said that his side is ready for Tuesday's clash, although he added that Ahly's mission will not be easy against the visitors. "Nejmah are a good side. They have many good players. We are lucky to begin our mission at home." The newly appointed coach also explained why he dropped several players from the squad that will face Nejmah on Tuesday. Team's Moroccan striker Walid Azaro, Tunisian fullback Ali Maaloul and Malian defender Salif Coulibaly will miss all the games to give them a chance to get some rest. "The team plays in several competitions and we have to adopt a rotation strategy to avoid injuries."